"Greet others with a smile." "Consider what is more important to you: to be right or to be happy." "Don't confuse your thoughts, feelings and perceptions with reality." 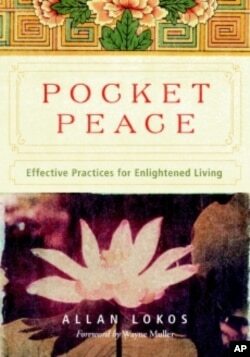 Those are a few of the 54 "pocket practices" in "Pocket Peace: Effective Practices for Enlightened Living" by author Allan Lokos. The interfaith minister and guiding teacher at the Community Meditation Center in New York City says each of the practices is inspired by Buddhist thought, yet intended to be useful to anyone of any religion in their everyday life. "This is as pragmatic as you can get," says Lokos. "Life is difficult anyway. It has incredible joys and wonders, and it's also difficult. And that's part of the inspiration of the book. How do we deal with that?" Lokos started offering pocket practices almost by accident one Sunday morning, while giving a talk on generosity at a meditation class in New York. It was October 2007, the U.S. economy was starting to buckle, and many of his listeners felt hesitant about being generous with others. Lokos suggested a practice where, every day over the course of the next week, the students would take five $1 bills with them whenever they left home. And when they came across come across a homeless or needy person, to give a dollar - without judging them. "And then I added," says Lokos "'also stop and give a moment of your time, and enter into a short conversation… and listen. Be with that person for a moment." Lokos left it at that. Lokos was astonished by the impact the exercise had on those who tried it out. One woman who had always taken efforts to avoid a homeless man on her street got up her courage, walked across the street, gave the man a dollar, and entered into a conversation with him. She told Lokos, "And now, every day, I pick up a cup of coffee and I sit with Tommy for a few minutes. I just love it. He's wonderful. He's just down on his luck." Another person said she didn't realize how much she had until she realized 'I had enough to give.' "And I know this person is not what we would consider wealthy, says Lokos, "but wealth has a lot to do with perspective." In Lokos' view, the perspectives we adopt are key to our happiness and peace of mind. He says most of us go through life thinking 'if he or she would only not behave that way, I would be so much happier.' We believe that, 'once I can get that new car, the bigger house or the better job, I'm going to be happy.' But ultimately, says Lokos, "what we find is if we cannot find happiness within ourselves, we cannot find happiness. There are 54 calmness-inspiring exercises in 'Pocket Peace: Effective Practices for Enlightened Living,' by author Allan Lokos. He admits "it's nice to get that nice, big new house," but "the inner happiness, the peace, the calm, the equanimity, that happens inside." Lokos offers this pocket practice for a change in perspective: every day for a week, sit quietly for five minutes, and simply say to yourself 'only I can destroy my peace and I choose not to do so,' and repeat as needed. "And what we see is we can't stop the rain from falling on the day we have tickets for the big game," Lokos says. "But how I experience that, what my perceptions are, that is for me to decide." Put another way: It's not 'the world is coming down on me.' It's 'how do I experience the world?'" 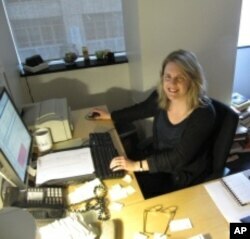 This practice has been especially helpful for Sara Carder, who edited "Pocket Peace" with Lokos. She's a busy New Yorker with a child, a long commute, and a high-powered job where she must deal with creative, yet often frantic, people. Sara Carder's job as a high level book editor in New York can be stressful so she turns to "pocket practices" for a measure of peace. "I feel literally trapped sometimes," she says. After working with pocket practice, she had a realization. "I can be more kind and patient with people when I just realize they can't get control what's going on inside me. Only I can do that. I am a person who can get angry quickly, and this stops me." Several pocket practices begin with a small pause that can make a huge difference. For example, when one senses the possibility of conflict with another over an idea or opinion, one can ask oneself "is there another way for me look at this?," or say to the other person "let me think about that." "It doesn't take much look to see there is always another way to look at this," says Lokos. He adds that the phrase has been invaluable in his own life. He cites a childhood where he was often insecure about himself and on the defensive. "So I felt a need to be sharp, to be clever and to be quick." However, he has since discovered that "when the answers come very quickly, the accuracy and sensitivity of those answers can suffer. And it took me a while to realize it was advisable, often, to say 'let me think about that.'" Lokos says there is nothing that can have a more positive immediate effect on all our lives than being conscious of our words. One pocket practice invites us to wait a moment and breathe before hitting the "send" button on an email message. Another offers a suggestion about teasing: don't. Kathy Forer, a New Jersey sculptor, chose to spend a week with the practice of not speaking about someone who is not physically present. "I never realized how much I talked about other people even when it's not gossip," she says. Doing this practice has led her to observe that talk about others is "never completely accurate. you are giving your view and it is clouded by what you feel," Forer says. "And if someone is not there, they are really at a disadvantage." Author Lokos acknowledges that while pocket practices may be simple, they are not easy. "I'll be absolutely honest about this," he says. "Every one of these practices can go deeper. We need patience with ourselves. We need patience with those around us. We need patience with the world."